Europeans are rather proud of how environmentally superior they believe themselves to be. For instance, Europeans were indignant when the U.S. decided to not ratify the Kyoto Protocol. In Germany, environmentalism is trendy, and the Green Party is actually a viable political organization, holding 10% of the seats in Parliament. Europeans also unscientifically (and ironically) reject nuclear power and GMOs, all over supposed concern for the environment. But, Europe has a dirty little secret. Actually, it’s not all that little. Seven of the ten biggest “dead zones” in the world are in the Baltic Sea, right in Europe’s backyard. And new research in PNAS says it’s mostly their fault. 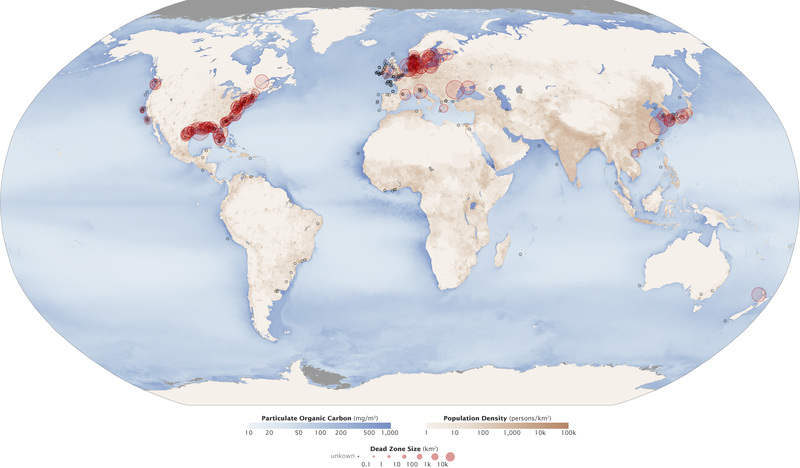 Dead zones form all over the world (see map) but are most concentrated around the U.S., Europe, Japan and Korea. They form when an excess of nutrients (e.g., agricultural fertilizer or processed sewage) makes its way into the ocean or other body of water. The spike in nutrients causes algal blooms, a process known as eutrophication. When the algae (which are often toxic) die, they are decomposed by bacteria that consume oxygen in the process, leaving little behind for fish and other organisms. Large areas become largely uninhabitable for marine animals. Obviously, this negatively affects the entire ecosystem, as well as local economies that rely on seafood and tourism. Because of its geography, which limits its ability to exchange water with the Atlantic Ocean, the Baltic Sea is naturally prone to developing dead zones. 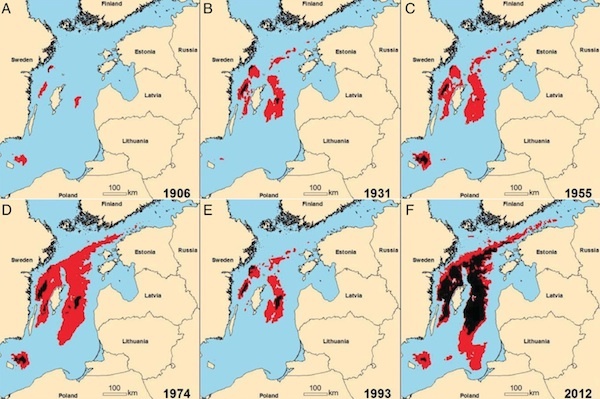 The authors examined oxygen concentrations on the bottom of the Baltic Sea over a 115-year period. (See figure.) Red areas are hypoxic (less than 2 mg oxygen per liter), and black areas are anoxic (no oxygen). The model before 1960 is less certain due to sparse data collection. As shown, the authors believe that hypoxic and anoxic zones have greatly increased. They believe that the major factor at play is an excess of anthropogenic nutrients. The same problem is to blame for the dead zones in the Gulf of Mexico and Chesapeake Bay. The solution is straightforward, though not necessarily easy to implement: Stop polluting so much. But, the authors identify another factor: Warmer temperature. The temperature at the bottom of the Baltic Sea has increased by around 2 degrees Celsius in the past century. This has two effects. First, oxygen is less soluble in warmer water. Second, warmer temperatures provoke faster metabolism in bacteria, causing them to consume oxygen more quickly. Warmer temperature, therefore, exacerbates the problem of oxygen depletion. The takeaway lesson is that a combination of natural and man-made factors are slowly destroying some of our most precious resources. We can reverse some of this damage if we act now. So, instead of continuing with business-as-usual (by pointing fingers and assigning blame, but doing very little), perhaps it’s time that we all just pitch in and clean things up.